While I had raced Ironman Cozumel 5 times (4 times as of September), I had yet to ever race the 70.3 there. I had heard some horror stories of the heat there which was actually my reasoning for going there. Half Ironman racing has never really been my strength, but sometimes when the races shift into somewhat of a war of attrition, I can move up late in the day. The race itself didn’t quite play out as I had expected. I kicked it off with one of my worst swims in at least the last 5+ years. I actually thought I was swimming in between two packs (off the back of lead pack, in front of chase pack) so when I got out on the bike I was expecting some folks to ride through me. After 20-30K of riding I suddenly realized I was actually behind everyone. Whoops. I was still motivated to ride hard, but I was only able to stay on the gas for about 60K while the last 30K saw me falling off the power quite a bit. The conditions on the run could best be described as soupy. As such, I was able to move up from 12th or 13th at the start of the run to 7th at the finish; two of the last places coming in the final 3K or so. While the race ended on a higher note, I knew I needed to clean things up a good bit before IM Cozumel in seven weeks. Ironman Cozumel is race that has always humbled me. 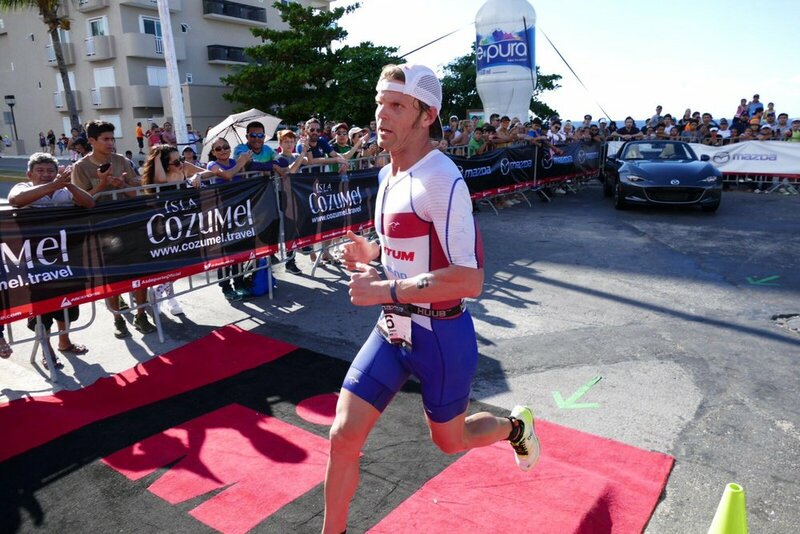 I have 40 Ironman finishes and 4 DNF’s; two of those four DNF’s have occurred in Cozumel. 2013: Training had been going well, but the Monday of race week I came down with a bad chest cold. Traveled to Playa del Carmen on Thursday. On Friday morning we walked to the ferry and I almost passed out (not hyperbole). On Saturday morning we debated whether or not I should even check in my bike. I ended up doing so at the last minute. My cough had subsided the night before the race so I decided to start, but told Brooke to be ready for me to drop out if things went south. I ended up staying in the race, and while I was 30-40 minutes off the lead, I managed to finish in 6th, catching the final places in the last 10K. It is actually one of the races I am most proud of, but that’s a longer story and this is already tangential enough. 2015: The year had been very back-end loaded and this was set to be my 4th Ironman in 20 weeks. I started the bike and was just mentally fried. I pulled the pin before finishing one full loop of the bike. DNF. 2017: The best lead up and fitness for this race I had yet to pull together. Raced the swim and bike well. Unfortunately GI issues struck pretty hard and it turned into a survival race for me. Fell from 4th to 8th on the run (probably lucky to finish in 8th). This year, Ironman Cozumel finally played out without any dramatic elements. I ended up finishing in 4th and while I would prefer to be on the podium (I have 6 4th place IM-finishes), it was by far my best complete race on the island. I had a much better swim, coming out of the water in 6th and exiting t2 in 4th. The bike was pretty even, but I lacked some of the peppiness needed in the early part of the race. The run was pretty good other than a low point from about 28-35K in the run (essentially the out portion of the third loop). This is subjective, but I actually found this year’s race to be the warmest of all the full IM’s I have competed in Cozumel. This might have had more to do with the complete lack of cloud cover from start to finish as opposed to the overall high temperature. Brooke and I spent a few days in Mexico relaxing before heading home. I felt pretty smoked after the race so I was debating whether I wanted to actually give Indian Wells a try (race was 3 weeks post-IM). I decided to do some light training for about 4-5 days before making the call. About ten days post IM (about the same to Indian Wells), I decided to give it a try. I had a minor setback when I crashed my bike (one week before the race) after hitting some black ice in a shady section of road. Fortunately, all the winter clothes I was wearing spared me from much road rash and while I was quite sore for a couple days, it seemed to not have many lingering effects. I don’t generally consider myself someone that “holds fitness” well so I was a little uncertain as to how the race would play out. I had gotten in a couple decent swim and bike workouts, but I had only run 6 times in the previous three weeks and while there was improvement from run one to run six, I hadn’t seen anything that made me feel back on form. Indian Wells 70.3 was a first year event taking place in the Palm Desert/Indian Wells/La Quinta area. I haven’t really spent any time there other than driving through the valley on my way to LA a long time ago. The most challenging part of the race, in my mind, was the first leg. The water was 56-57 degrees which is pretty cold by my (and I think I can say most people’s) standards. Some unforeseen race morning logistics limited me to about 2 minutes of warm up which I’m not really sure was to my benefit since they pulled us out of the water ten minutes prior to the start. I never really felt comfortable in the swim. I was always in a group, but it seemed like every 100 meters or so I would move back a position to the point where I was dangling at the back by the swim finish. The water was definitely cold as had major vertigo in the change tent and had to sit down to take my wetsuit off (my feet stayed numb until 5K into the run). T1 was pretty long and I ran about as fast as I ever have in a transition to try and move up. The good part was that I could tell my legs felt pretty fresh. I don’t have to feel good running to the bike to eventually have a good race, but it’s always a positive sign when I do. Both the bike and the run went better than I would have expected. More so the run given the training I had done. I ended up finishing in 8th place, just 31 seconds out of 5th. It was a good reminder to not take any moments in a race for granted as a few seconds here and there added up to several positions in this race. I might have been a little more frustrated had this race been at another time of year, but under these circumstances I was happy to have raced well beyond my expectations. 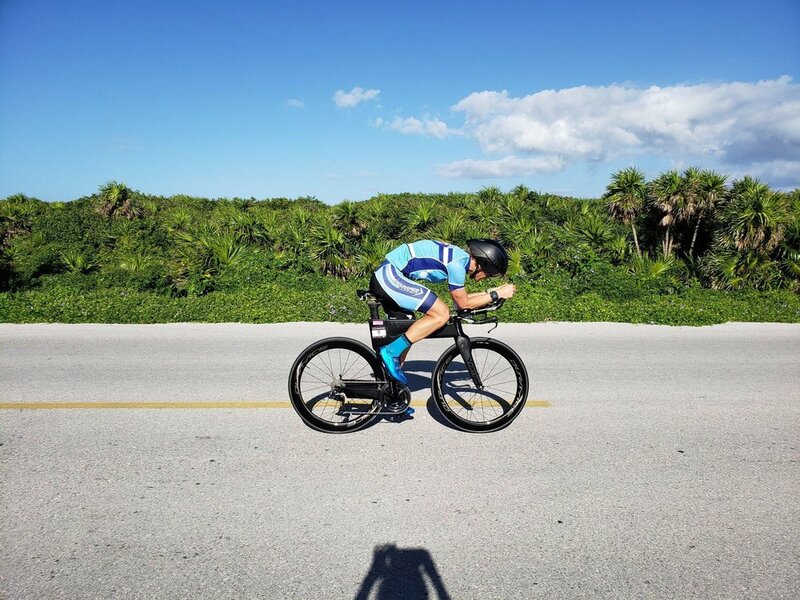 No more racing this year as we only have a few days left in 2018, but planning to start the 2019 season in Mexico at Campeche 70.3 in March. I posted a few races after that on this site, but they are honestly pretty tentative at the moment. Pre-race swim in the Cozumel pool. Ran into some friends and got to check out a local swim meet going on in lanes 1+2. While I do normally like to do pre-race swimming in a pool, there wasn’t another option this year as the days leading up to the race had very rough seas. Riding on the east side of the island the day before the race. Typically my pre-raceday ride includes a gradual warm up, then 4 x 90 seconds at a pretty solid effort. I do this same type of ride one day before a lot of my key longer training session. I find a slight opener the day before the race to be better for me than just going easy. Everyone is different in that respect. Getting some video action. I think the presence of video camera always makes me run faster; not sure if it’s peer pressure or trying to get away from the exhaust fumes. Finally making it to the finish chute after having to run right past it when starting laps two and three. Swimming butterfly on tired legs in a hotel pool. All For The Gram. Traveled with my own Chris Stapleton koozie to help keep all post race beer cold. Final hours in Cozumel. Cozumel is known for its diving and snorkeling and with the water in the background you can clearly see why. A pretty bike in the California sunshine. I spent a couple days before and after the race in San Diego with Ray Picard and his family. Ray and I in Indian Wells. Ray went on to finish 2nd in M35-39 and 6th overall Age Grouper. Riding my bike through very well manicured neighborhoods. Rolling back towards T2. While this shot was on the road, most of the run was on golf cart paths. I thought it would feel pretty lousy and choppy, but it actually flowed rather nicely. Since we were weaving back and forth you could see other parts of the run course at all times. I don’t normally wear compression socks, but since the water was cold enough to allow booties in the swim, I wore them under my wetsuit. I was hoping it might offset some of the cold on the bike, but given how numb my feet stayed, even well into the first loop of the run, I would describe that decision as somewhere between bad and very bad. Post race exploring on Pacific Beach. I hadn’t been to San Diego (proper) since 1994 so it was fun to cruise around.